On Monday November 4th the HFA Gallery opened its second exhibit of the year. Deliberately aimed at presenting a pair of sharply contrasting artistic styles, the new exhibit consists of works by Kathryn Arnold and Chris Bartone, and will be run through December 4th. Kathryn Arnold of Lenexa Kansas works on seven-by-seven foot canvases, adding layer upon layer of paint to several pieces at a time. Each piece involves about four months of work including drying periods. As she explains in her Artist’s Statement — “Qualities of touch and a chaotic energy of color marks build up layers of paint that create an encompassing, enveloping visual field.” Using a subtle grid to “establish a formal structure that in its relationship with the organic nature forms a contrast that develops relationships having to do with language,” Kathryn creates a blaze of nonobjective, abstract, chaotic improvisation. She stresses the importance of the viewer’s participation in her pieces, but adds that each work presents a set of basic themes that come from her own experiences. When asked about her influences, she cited the concept of “field paintings” by such artists as Helen Frankenthaler and Jackson Pollock which are intended to create the sense that they “go on and on forever, usually either horizontally or vertically.” Kathryn’s works, however, intended to give the viewer a sense of infinite depth. The works on the second floor of the gallery are a different story entirely. Curtis Bartone of Chicago, Illinois presents a more “still-life type of art on a much smaller scale. His portion of the exhibit consists of very detailed paintings, drawings and etchings of deserts, frogs, snails, birds, flowers and other plants. “We feast both gastronomically and visually as living parts of our natural world are harvested and rendered either as food or as harmless displays. Nature works best on our time — reassembled and stripped of any real threat,” he writes. One of the highlights of his portion is a stark four-part series of etchings, entitled the “Poultry Suite” of birds that are becoming food. Curtis’ work is symbolic as opposed to abstract, and leaves plenty of room for interpretation. He has picked obscure subjects and put things into interesting, amusing combinations, and he leaves it up to the viewer to decide their importance or relationship. The organizers of this exhibit have certainly found the contrast they sought in these two artists. They are about as different as is possible in the realm of two-dimensional art. One things they do have in common, though, is the fact that their art possesses that intangible, indescribable quality that makes it worthwhile. 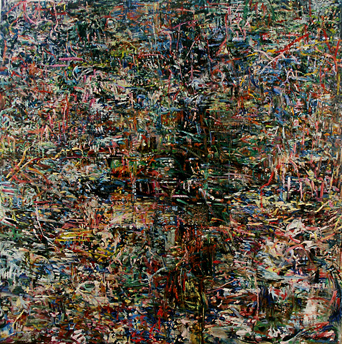 “Qualities of touch and a chaotic energy of color marks build up layers of paint that create an encompassing, enveloping visual field.” Using a subtle grid to “establish a formal structure that in its relationship with the organic nature forms a contrast that develops relationships having to do with language,” Kathryn creates a blaze of nonobjective, abstract, chaotic improvisation.